The right to form private contracts is fundamental to free enterprise. But you need to know what you’re doing when you sign one. Most entrepreneurs don’t take time to read the contracts they sign. That could be dangerous, because your signature on it is taken for an admission that you have read it, which is especially true when you sign on behalf of a business. Furthermore, if you are signing a contract to provide services to your customers, you should have your own template contract. But if your customer insists on using theirs, you really should pour over every aspect of that deal. Your customer (especially if it’s a large company) is probably hiding things that could come back to haunt you. You may think you can’t afford to hire a lawyer for that review. That’s faulty thinking, but this article is not about convincing you of that folly. I’m writing this to help you be as much of your own lawyer as possible. When you get to the point of outsourcing the parts of being an entrepreneur that you are not particularly good at, you will hire a good business attorney to handle contract review and negotiations for you. Until then you need to be responsible. Unfortunately, many contracts seem daunting because of their length and because you don’t know what to look for. So for the hurried entrepreneur who doesn’t yet have a lawyer, here are the seven must-read sections in contracts you are asked to sign. 1. What are each party’s duties? When you are signing someone else’s contract, many times your primary duty is to pay for goods or services. Check to make sure you don’t have any other duties you need to be aware of. Also pay particular attention to the other party’s duties. Are those duties what you expected them to be? Oral promises made before the contract is drawn up don’t matter if those promises don’t appear in the written document. 2. How much you are going to pay? There should be a section called “Compensation” or something similar. Look for a total amount, periodic (e.g. monthly or quarterly) payment amounts, possible late fees and penalties, commissions, expenses. What parts are refundable and what is explicitly non-refundable? It all should be spelled out, but unfortunately some of the payment information may be spread out in multiple sections of the contract. If you have an electronic version of the document, search for “$” and “%” but don’t rely only on the results of that search. I like to include installment payments made against milestones achieved. All other forms of payment have higher inherent risk for one of the parties. 3. Term and Termination. If you get into the relationship, you might well want a way out. How long does the contract last? Can the other party terminate early and under what conditions? More importantly can you terminate early? Are only specific reasons allowed for termination or can you terminate for any reason at all? How much notice do you have to give if you do, and is there a fee for early termination? Some contracts attempt to charge you a penalty for early termination, even if you don’t receive any additional goods or services after you terminate. Strictly speaking penalties are not allowed under standard contract law, but they’re found in contracts all the time. To get around penalties, the contract may say that you can pay a discounted rate if you do not terminate for a year, and then require you to pay a “make up” fee that recovers the discount amount if you terminate early. This kind of arrangement may be enforced by courts. 4. Dispute resolution. Near the end of every contract are some “boilerplate” terms that might have a big impact on you. Look for the governing law and dispute resolution terms. They might be in different sections of the contract. Generally the party who drafts the contract will choose to have the laws of their own state govern the interpretation of the contract. The laws of different states tend to be only subtly different, so unless you know the differences, you might not want to dispute that. More importantly, is there a venue selection clause or stipulation to arbitration? If the contract says that you must litigate disputes in the courts in some county in another state, you would likely be at a distinct disadvantage. Some companies prefer to settle disputes only through binding arbitration. Before you agree to that, know that you will be giving up the right to a jury. Jury trials are expensive for everyone, but you might prefer to have the option to choose the courts to settle your disputes rather than an arbitrator. 5. Who pays attorney fees? The default rule in American courts is that each party pays their own attorney fees. Think about whether you want the loser to pay the attorney fees of the winner. If this is written into the contract, it makes litigation likely to be much more costly for a party that has a weak case. 6. Retain Your Intellectual Property. If you are hiring a company to do creative work for you—creating a website, writing copy for social media postings, developing an app for your company’s products, etc.—you want to own the product at the end of the project. The default rule when you hire independent contractors to do creative work is that the developer owns the end product, not you! You can overcome that default only by making sure there is a “work made for hire” clause in the contract. You also want a provision that says you retain ownership of any of your own creative work used in the product. Finally, if you have to share company-confidential information with the other party, make sure the contract says he has to protect that information. 7. Indemnification. If something goes wrong during your use or delivery of a product or service and a third party is harmed, that harmed person is likely to sue everyone who was even remotely involved in delivering that product or service. And that means you might be dragged into a lawsuit because the party you contracted with to make the product screwed up. It could be for copyright or patent infringement, careless product design, or anything else. An indemnification clause would say that you get compensated (in the form of having your attorneys fee paid) in case that happens. And oh, by the way, your contracting partner will want to be indemnified for his attorney fees in case you were the actual one who caused the harm to the third party. If there is an indemnification section in the contract you sign, make sure you are indemnified, not only the other party. 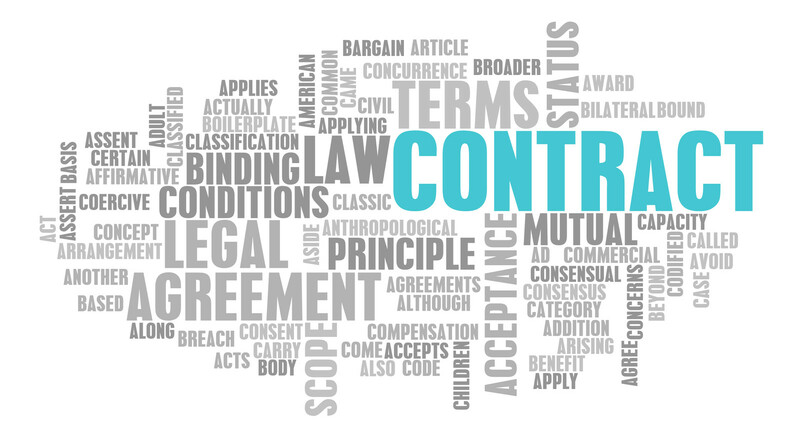 There are typically a lot more sections in a contract, and those other sections are important too. But by finding and reading at least these 7 sections, you will be better off than you would be if you had not read any part of the contract. Finally note this: Don’t sign a contract that doesn’t represent your interests. Negotiate for changes. Entrepreneurs are going to save the world, and Argent Place Law wants to help. That’s why we are a team of entrepreneur-lawyers who provide Legal Business Counsel to Government Contracting Entrepreneurs just like you. Think how great will it be to have a legal team with entrepreneurial experience on your speed dial so you can call us up and say, “I have this great opportunity with a new customer, will you help me negotiate the contract?” Call Argent Place Law to find out.